Tooth Decay Treatments | Online Pharmacy UK | PostMyMeds Ltd.
View our range of tooth decay treatments. Tooth decay, also known as dental caries is one of the most widespread health problems in the UK, which occurs when acid in your mouth dissolves the outer layers of your teeth. Bacteria present in your mouth may combine with small food particles and form saliva, forming a sticky film known as plaque. Bacteria in plaque produces acid as it converts food and drink high in carbohydrates (particularly sugar) into energy. If a plaque is allowed to build up, the acid can begin to cause damage. This explains why poor diet and poor oral hygiene may increase the risk of tooth decay. If left untreated, further complications including cavities, gum disease or dental abscesses may occur. Adults over 18 years of age should have a check-up at least once every two years. We only taking Colgate Duraphat if you are seeing your dentist regarding tooth decay (dental caries) and are receiving regular dental care. Therefore, it is important to see your dentist, before & after obtaining Colgate Duraphat 5000ppm on prescription as your dentist will need to review your dental caries and decide upon the best treatment option. Every individual will benefit from keeping their teeth and gums as healthy as possible and practising good dental hygiene. 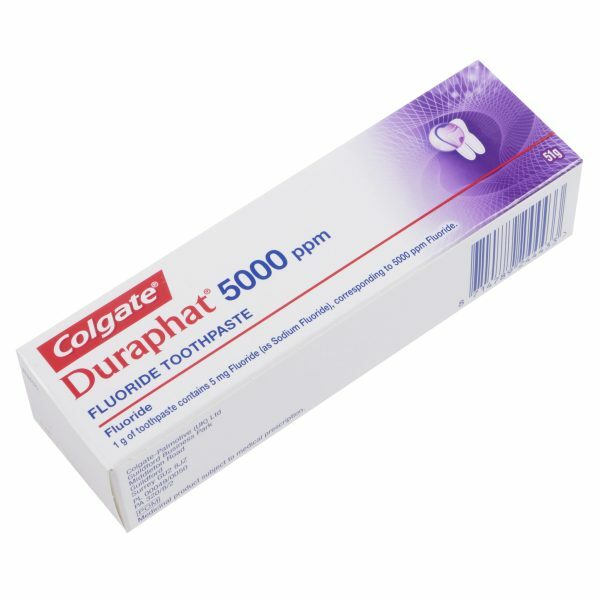 If you are at risk of tooth decay, you may benefit from Colgate Duraphat 5000 ppm, which is a high fluoride toothpaste. In addition to correct brushing, you may also benefit by flossing your teeth at least once a day, avoiding rinsing your mouth with water or mouthwash after brushing and cutting down on sugary and starchy foods and drinks.